If he came from another home, objects like leashes, hands, rolled up newspapers and magazines, feet, chairs and sticks are just some of the pieces of “training equipment” that may have been used on this dog. Words like “come here” and “lie down” may bring forth a reaction other than the one you expect. Or maybe he led a sheltered life and was never socialized to children or sidewalk activity. This dog may be the product of a never-ending series of scrambled communications and unreal expectations that will require patience on your part. 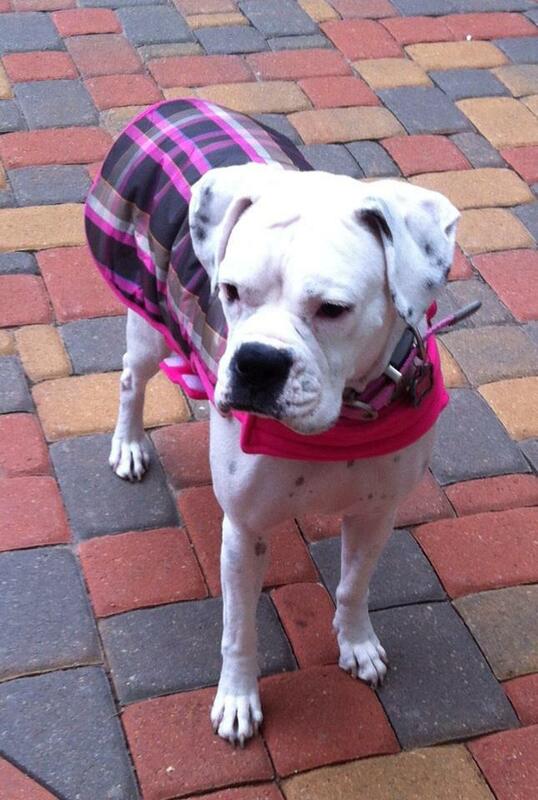 Pearl (formerly Amelia) wanted to show off her new winter coat. Life continues to be brighter here in the Tenpenny household because of her. Several of my friends have fallen in love with her- momma Lindsay Shive, momma Amanda Zander and momma Kristen Verbick – to name a few. These sweet ladies take such good care of my girl when I’m on call or out of town. I feel like Pearl knows the we all saved her from an unspeakable fate and her genuine and lovable spirit is a reflection of that gratitude. I love her more than words can say. Thank you again, K-9 Angels, for all your hard work. Merry Christmas!